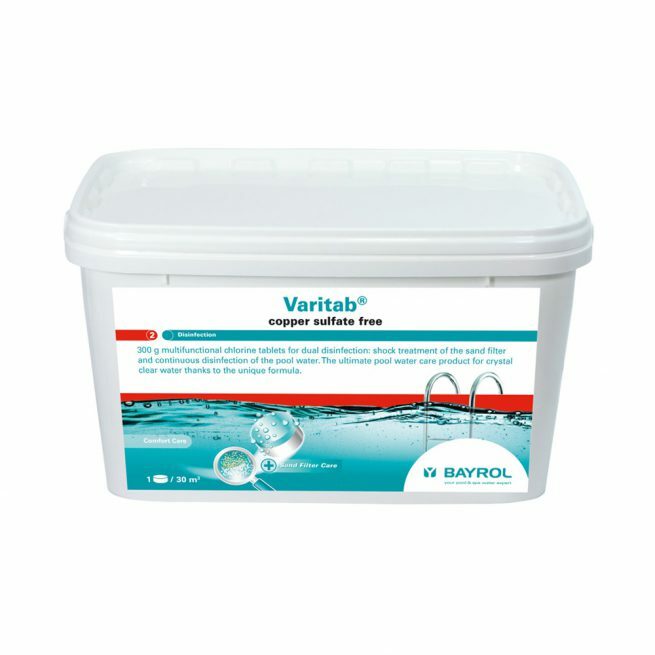 Bayrol VariTab 2 layer tablets (5.4kg) for quick and long term disinfection and filter cleaning. 18 Tablets. The VariTab with variable dissolving speed has a dual effect in swimming pool water. Phase 1 | The upper blue tablet dissolves quickly and causes shock chlorination. This eliminates existing turbidity and kills existing bacteria. The sand filter system is also cleaned and disinfected. Phase 2 | The lower white tablet dissolves slowly and is effective against bacteria, viruses, and fungi over a long period. At the same time, flocculent is continuously added to eliminate disbursed turbidity. The hardness stabilizer works against calcium precipitation. The particularly effective combination of fast and slow dissolving disinfectant guarantee double hygienic safety and thus ensures extra clean and clear water.